I previously have emphasized that an association between precociality and encephalization in mammals has special implications for early primate evolution (Shea, 1987). The summary in Table 3 reveals that small-bodied mammals are typically altricial, while moderate-to-large sized mammals are generally precocial. This is related to the fact that most small mammals are characterized by the "live fast and die young" strategy of rapid reproductive turnover and high mortality (e.g., Promislow and Harvey, 1990; Read and Harvey, 1989), while large body size with its positively associated increases in gestation lengths and longevity are generally linked to precocial adaptations. But most strepsirhines and many Eocene forms, which might serve as models for early euprimate evolution, are quite diminutive. This means that the small early primates were unusual mammals in adopting such strongly precocial reproductive and life history strategies at quite small body sizes (Shea, 1987). Reconstruction of early primate body size is somewhat problematic due to the sparse fossil record and other factors. However, most authorities (Cartmill, 1974; Fleagle, 1978, 1988; Martin, 1975b) favor a body size of perhaps several hundred grams, in the range of various cheirogaleids and galagids. Suggestions by Soligo and Muller (1999), based on nail and claw morphology, that the first primates were at least a kilogram in size, and that all primates smaller than this rubicon are therefore "phyletic dwarfs," remain unconvincing (Hamrick, 1999, 2001). The finding of extremely small forms interpreted by Gebo et al. (2000) to be early (Middle Eocene) haplorhines raises at least the possibility that the initial diversification of anthropoids occurred at body sizes considerably smaller than observed in any living primates. Additional fossils and analyses will further clarify these issues. Our current best reconstruction of body size in the first euprimates would therefore range from about 100 to 500 g at most. Of key relevance to this chapter, however, is the central fact that any reasonable reconstruction of ancestral body size in early euprimates puts them toward the smaller end of mammalian and current primate body size ranges. Bennett and Harvey's (1985) critique of Martin's (1981) linkage between precociality and encephalization. It may eventuate that the association holds in smaller size ranges, but not in larger ranges. Larger mammals in general tend to be highly precocial, with the exception of some carnivoran and other species, so such comparisons are skewed phylogenetically. 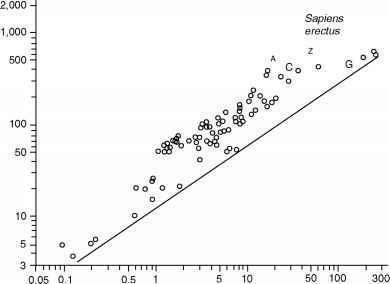 A comparison of selected primate taxa with comparably sized mammals exhibiting small litter sizes and a significant degree of precociality allows an indirect test of these associations. Various taxa for which brain and body sizes are available have been collected in Table 4. The fact that direct comparisons are hard to come by within the mammals is in itself a statement that the combination of small body size and marked precociality is an unusual adaptive strategy. Small nonprimate mammals exhibiting precocial adaptations include some of the rodents (e.g., chinchillas, agoutis), elephant shrews, hyraxes, and some bats and tree shrews (though these are more appropriately characterized as having small litter sizes rather than particularly precocial young). Other species, such as the moderately precocial spiny mouse (Acomys cahirinus), would provide important contrasts with altricial related species (Brunjes, 1990), but data on gross and relative brain sizes are unfortunately not available. The comparisons in Table 4, grouped in three size classes ranging up to 2 kg, indicate that other precocial mammals comparable in size to the selected primate species have similar estimates of relative brain size. In the smallest size range, the elephant shrews and the pteropid bat compare favorably with Microcebus murinus. The middle size range representatives include several tree shrew species and two pteropids compared to a cheirogaleid and lorisid. Again, encephalization levels in these nonprimate precocial forms are comparable to the primate examples. This is also the case in the selected species clustering around 2 kg in Table 4. The kinkajou has the highest relative brain size here, and it is among the most precocial of the carnivores. The hypothesis that the combination of small size and marked precociality is generally associated with higher-than-average relative brain size in mammals deserves further scrutiny. The rodents are probably the best group in which to assess these relationships within a controlled phylogenetic context, since they provide examples of both altricial and precocial groups which overlap in body size. Other key mammalian groups include the elephant shrews, which are small and quite precocial forms; the bats (Jones and MacLarnon, 2001); and the hyraxes, which, though currently moderately small, were represented by much larger forms in the past.